Can you predict the birth-date of a person without him telling you? Can you predict how much money a person has without him telling you? Can you check the final answer without solving the question? Or, in a special case, get the final answer without looking at the question? Can you solve squares, square roots, cube-roots and other problems mentally? 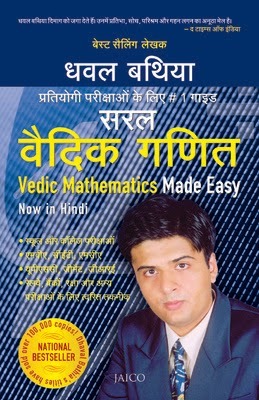 All this and a lot more is possible with the techniques of Vedic Mathematics described in this book. The techniques are useful for students, professionals and businessmen. The techniques of Vedic Mathematics have helped millions of students all over the world get rid of their fear of numbers and improve their scores in quantitative subjects. Primary and secondary school students have found the Vedic mathematics approach very exciting. Those giving competitive exams like MBA, MCA, CET, UPSC, GRE, GMAT etc. have asserted that Vedic Mathematics has helped them crack the entrance tests of these exams.